Let's celebrate! Roxette finally announced the much-awaited world tour in 2011! Five continents, fans from around the world, and this is not all. A brand new album will be coming out in the first quarter of 2011! What can we say, the perfect recipe for every rox-fan to make his head go pop! In anticipation of these great events, we want to fuel your excitement with some very nice photo collages from the recent Roxette events. Our friend, Ovidiu Ardelean was there and selected the best shots to make a wallpaper gallery for all the fans out there. 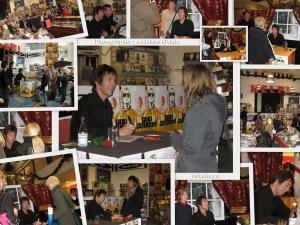 You can see pictures from Gessle over Europe, Stjarnklart, Nokia Night of the Proms and the Goteborg autograph session. Enjoy! View the gallery here. All the pictures are also available in wide format. Per Gessle with family Åsa and Gabriel are in Caroline Roosmark's 2008 calendar "The Women and Men of the Year 2008." "Per usually doesn't do things like these," Caroline says, "but this time he's been very into it. He spent days picking out a good wig!" As you can see Per, "pop legend," is dressed in a Mozartesque style, with a "guitar" of course (It's called a lute.) He is in May's picture.